In an attempt to get one leg over Flipkart, Amazon India has today introduced Coupons to offer additional discounts to buyers landing on its platform. 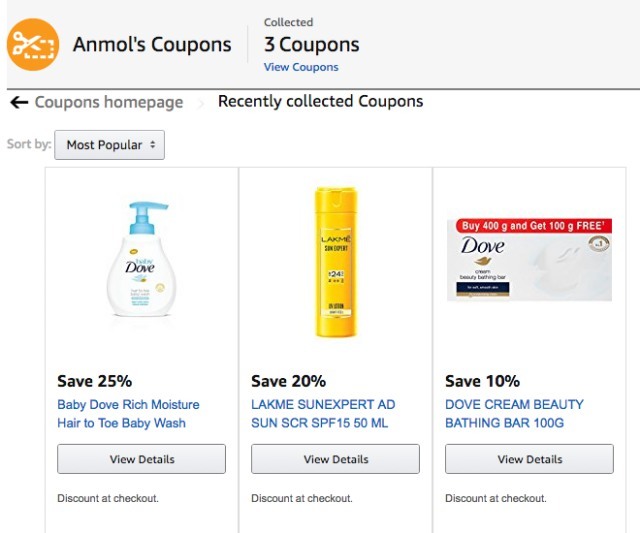 Yes, coupons may be quite a common discount tactic, it has been picked up and released in a revamped avatar by the e-commerce giant. Amazon Coupons, as the name suggests, are discount tokens that are applied to a product in your cart for additional savings. The company has, however, eliminated all the hassle of copying and pasting a code by making them available via a digital ‘Coupons’ bank. The buyers can spot these coupons either on the Coupons webpage, product page, search, product listing pages and even in your shopping cart. All the discounts offered by these coupons are not being rendered by Amazon but instead the sellers on the platform — at its sole discretion. Once you see that a coupon is available for a certain product, or a category, you just need to click on the ‘Collect Coupon’ button seen on the page. This means if you’re planning to purchase products in that category and you add them to your cart, the discount coupon will instantly be applied — once you reach the payment window. Yes, just like the normal coupons, these also have an expiry date. You can collect as many coupons as you like right now, saving them to your Amazon account. They’ll be applied to the cart automatically if you purchase an item from the seller whose coupon you have collected, or else it’ll be removed from the account once it expires. If you collect a Coupon for 10% off on Item X worth ₹100 and you go on purchasing 4 units of Item X for ₹400, you’ll get a total discount of ₹10 only, and not ₹40. In addition, the e-commerce giant is also running an ‘Amazon Coupons Quiz’ to promote its new discount category among the users. If you answer all 5 questions correctly in this quiz, then 40 people stand the chance to win ₹5000. You can choose from 4000+ coupons under the currently ongoing ‘Coupons Carnival’ that lasts until 20th March. So, if you’re looking to score hefty discounts on beauty or apparel, the coupons may help you out.